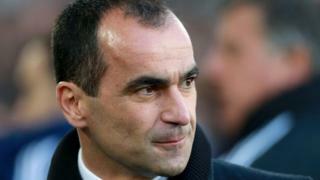 Everton boss Roberto Martinez praises his side's "incredible effort" after they beat West Ham 2-1 at Goodison Park. Romelu Lukaku gave the home side the lead in the first half, and despite the Hammers equalising through Mauro Zarate, Leon Osman marked his 400th Everton appearance with the winning goal. This was Everton's 200th home win in the Premier League.